The horrifying pollution within China is well-known. What’s not so well-known is China’s devastating impact on the entire world’s forests, wildlife, oceans, rivers and climates. In New Guinea, many of the world’s last great forests are being felled and exotic rare birds threatened to meet China’s demand for timber; in Brazil, large swaths of the Amazon are being cleared to plant soybeans for China; in India, poachers are hunting and killing tigers and other endangered animals to extinction to feed Chinese demand; in New Zealand, land is being turned over to dairying at an alarming rate to provide food for China; in Australia, countryside is being eaten up and polluted for mines supplying coal to China. In this brilliant book, Craig Simons visits many of the places, people and communities affected and produces a devastating report. The Devouring Dragon looks at how an ascending China has rapidly surpassed the U.S. and Europe as the worst-polluting superpower. This book asks questions that need urgent answers if life on Earth is to survive. A Wilson Center interview with Craig Simons can be viewed here. A New York Times interview with Craig Simons can be found here. 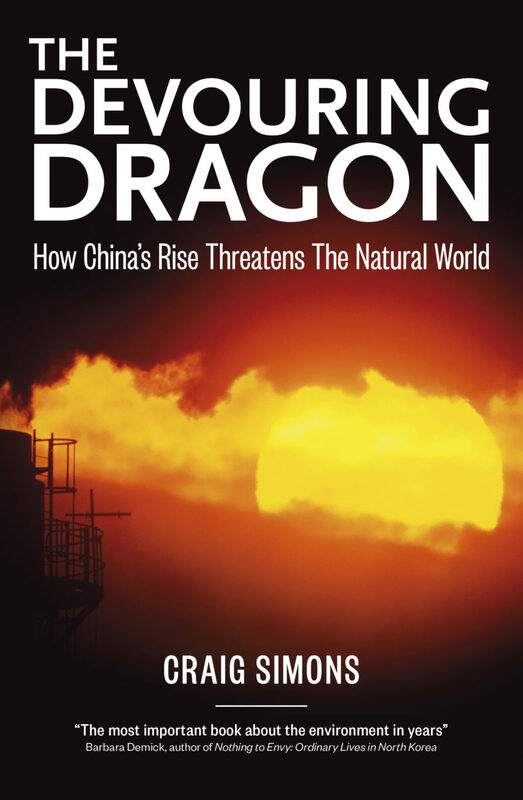 Craig Simons’ insightful account of environmental issues highlights the role of China (and other rapidly emerging economies) in shaping global futures…Simons crafts an engaging and accessible blend of facts, stories and anecdotes to weave a grounded account of how environmental problems come about and their broader societal implications. Listen to an interview with Craig Simons on Radio Live with Graeme Hill here. Craig Simons goes looking for the collateral damage of China’s economic miracle, and finds it in some surprising places, skillfully marshalling the little vignettes that tell the big story. I’ve read a bookshelf of environmental books, but none has pulled together multiple strands so awfully well.